Beetle Wings! Beetle Wings! Beetle Wings! Oh dear. Did I just title my blog post with an ’80’s allusion? I just dated myself – and if you get it, you were probably in high school then, too. In any case, I am awash in beetle wings these days. And you might think that’s a little gross, until you delve into the history of beetle wings used in embroidery and textile adornment. Trust me, I’m not usually too enamored of bug parts in general. But beetle wings are different. They have a certain scintillating beauty that I found very hard to resist – and very difficult to capture on camera. If you heard about the famous Ellen Terry beetle wing dress restored a few years ago – a dress worn during the actress’s portraying of Lady Macbeth in 1888 at the Lyceum in London, and, a year later, immortalized in the portrait painted by John Singer Sargent – did you ever wonder what 1,000 beetle wings might look like? Well, I will tell you. In a heap, they look just like that pile in the photo above. What fascinates me most about beetle wings? I think it’s the range of colors found in the elytra (or outer wing) of only one species of beetle (sternocera aequisignata). The wings range from a deep coppery color (which are somewhat rare), to a fairly solid green with just a hint of blue or yellow to it, to a brighter yellow-green, to a predominantly blue blue, and finally, to a blue that’s so dark it looks purple in some lights. And I’ll be writing a little bit more about beetle wings in embroidery later on, as I work through some samples for a magazine article. I’ll also be sharing some tidbits of information about the wings and their use in textiles and other arts. In the meantime, I’ve got to figure out exactly what one does with 1,000 beetle wings. I’m pretty sure I can’t pull off a Lady Macbeth! Oh wow! 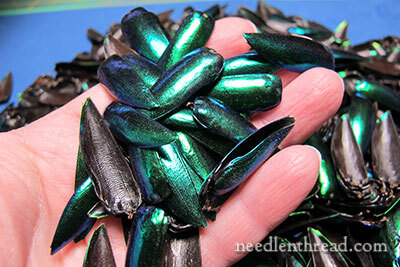 That’s a ton of beetle wings! They are absolutely beautiful – once you get past the thought of what they are. I’ve seen people using them in stumpwork projects to create, what else, but beetles. I’ve never seen them ‘for real’, and can only imagine how spectacular the colours are. I’ll be anxious to see what you make with them! I don’t know if you’re familiar with this wonderful dress incorporating beetle wings as the ‘eyes’ in a peacock feather design: http://www.pinterest.com/kalmia17/kedleston-hall-derbyshire/ I saw it last year and it’s stunning. No photos do it justice but the ones on this Pintrest page are better than the official National Trust ones I’ve seen! I remembered your previous articles but went back to scan them again. I had a couple of questions and thought you may have answered them before. I found out they do not come pre-pierced like beads. You have to decide yourself where and how many times to pierce them. Not a simple project I see. They’re not 100% identical and you do trim them. One question I still have: do you have to store them a special way so they don’t rot? They are biological in nature and it would be a shame to have them decompose in a baggie some where. Which brings me to after care. Once they’re stitched on fabric, how do you clean or care for the project? I’ve seen at least one very old piece of furniture decorated with inlaid beetle wings in a museum in Japan. Maybe it’s the one that Mary is thinking of? Due to age, the wings had lost their iridescence, but apart from that they were still fine. Bear in mind, though, that Japanese summers are hot and very humid, and that winters are cold enough for snow. On top of that, houses used to be (and sometimes still are!) completely unheated in winter. So they had been through a lot of temperature fluctuation over several centuries, but were still intact. Thank you for the article, I never knew that the Lady Macbeth dress is still out there! You could also use them as fake fingernails. ;) I know some nail art devotees who would adore those colors. LOL! Yes, you could! It might be a little different or weird, but I suppose it could be done! That’s one of the first things that comes up in conversation when people see the loose wings in person. Fingernails! They are beautiful especially the copper and green wings and so much could be done with these on embroidery projects the mind buzzes. My only concern is how are they sourced I would not like to buy them if the animal is harmed in any way, just a thought. Thanks for showing us these lovely coloured wings and look forward to your samples. I remember your earlier posts about beetle wings. I was unfamiliar with them then. While I’d love to have some in a nature display case, they don’t appeal to me for embroidery. I could hardly explain why. I love the colours, everything about them is beautiful. Maybe they seem just simply in a ‘wrong’ setting. I wouldn’t hesitate to use a leaf or feather in a freeform embroidery piece. Perhaps that’s what it is, too formal for my taste to be set in a definite pattern. I’ve used them in non traditional still life pastel artworks. One that comes to mind was of a striking patterned fabric, draped on a board with a hen’s egg, a broken bird egg, a colourful beetle and some beetle wings arranged in suitable order in and out of the fabric folds. I’m interested in your work with the beetle wings and will follow, no doubt, intrigued but I just wouldn’t be interested in doing it myself. *shivers* Ick I just can’t!!! OK I have to ask…….how did you come by 1000 Beatle wings? I have a picture in my head of you swooping down on the poor things with a ‘butterfly net’………Do they shed these beautiful shells? Google here I come! I think she mentioned in one of the other beetle wing blogs that she buys them. That still leaves the question: where do they get them? I’m guessing they grow them in captivity for this purpose just as silk worms are grown and cared for to harvest their silk. That’s correct. They are farmed – for the wings and for food. 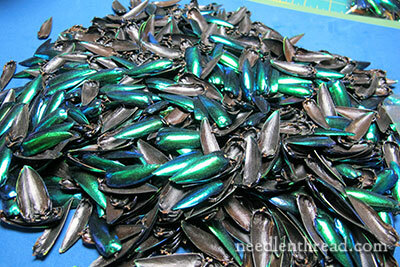 The elytra are removed after the beetles finish their very short (3-4 week) adult life cycle. So they’re dead before the wings are removed. The wings are therefore a by-product, and a good way to “recycle” something that would otherwise simply be waste. I usually look forward to reading your emails each day, but not today. In this day, why do we still thoughtlessly have to kill thousands of other creature for decoration when there are so many nonlethal alternatives? 1. Things that sound freaky at first, (like sushi and steak tartar) but with research and a little bravery can be amazing. 2. Things that are beyond attempting ‘mind-over-matter’ (like chocolate covered ants) no matter how adventurous one may be they hit the limit of their open-mindedness. For me embroidering with dead bug parts is right up there with chocolate covered ants. I have actually ate them due to a vicious trick by an Irish grandfather. I wish I could be more brave but I’m unfortunately not. I’m fascinated by beetle wings as well, going so far as to buy some for my stash, knowing that the proper design would eventually present itself. I have the shadow of an idea for a dragon….thought the wings would be beautiful as scales. Also think these would be beautiful as an abstract design in a multimedia piece over hand dyed and painted fabric. 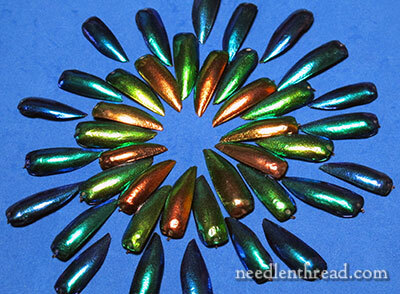 They could also be used with bead embroidery for jewelry. I read your piece about steaming and preparing the wings when you wrote it. Thanks for loving embroidery the way you do and for teaching and inspiring all of us in the more obscure areas of the Art. That beetle wing dress is amazing! So the pre-Raphaelites do the Medieval. So many styles of embroidery, so little time. For a look at a contemporary Costume Embroidered who is doing work on the same level, check out Michele Carragher’s website. She does the embroidery for Game of Thrones and she is generous with her techniques too. I think some of my fellow Needle n Threaders might be interested in her work. Colleen Atwood used them to robe the evil stepmother queen in Snow White and the Huntsman, as well. It would be a surprise if Atwood would not know of Terry’s Lady Macbeth gown. The costume exhibit gives detailed views. they are sooo beautiful. but for me I cannot reconcile myself to killing beetles to get them! i dont suppose you know lf any source for artifially made ones? hopw you don’t mind my asking.. definitely not trying to “shame” you! but I just can’t! I’m the same with silk? I just though you might have some ideas? thank you so much. Previous Previous post: What Do You Call Whitework Embroidery done in Color? Next Next post: My Favorite Embroidery Things…on Sale!